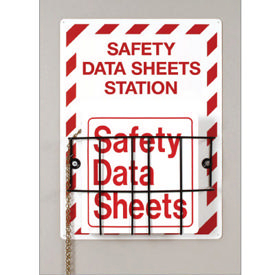 The SDS Single Station stores all Safety Data Sheets in one location. When GHS Safety Data Sheets are kept in one station, employees and inspectors can easily access them. This SDS Station includes a poly backboard, wire rack, and plastic SDS binders with a chain that attaches to binders to prevent misplacement. Delivery information: Includes one binder.